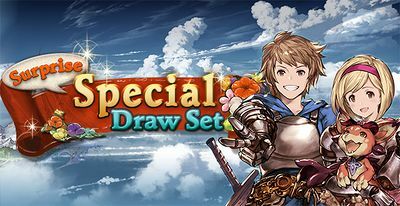 The Surprise Special Draw Set, commonly nicknamed Surprise Ticket (or simply Suptix), is very similar to the Beginner's Draw Set; for 3000 MobaCoin or GranblueCoin, you receive a Premium 10-Part Ticket in addition to a Surprise Special Draw Set ticket which can be exchanged for any character weapon or summon that is currently available in the Premium Draw except for unticketable characters and summons such as those that only appear in the Premium Gala and Flash Gala. You can preview what is available by clicking on the Use Ticket tab even before purchasing. The Surprise Special Draw Set ticket will expire 24 hours after the purchase period ends. To redeem a Surprise Special Draw Set, go to Draw and click on the Surprise Special Draw Set banner. In the Use Ticket tab, the exact expiration date and time of your ticket is listed. Below that is the pick interface, which lists all characters, weapons, and summons available from this Surprise Special Draw Set. Surprise Special Draw Set differ from the Beginner's Draw Set in a number of ways. The Beginner's Draw Set can be exchanged for any character weapon or summon available when your account was created, not from what is currently available. This means that Surprise Special Draw Sets include more recently released characters, while the Beginner's Draw Set does not. The Beginner's Draw Set returns every month for 48 hours until it is purchased, after which it never appears again. Surprise Special Draw Sets are each separate, meaning that any player can always purchase a Surprise Special Draw Set whenever it becomes available for purchase, no matter how many Surprise Special Draw Sets that player has bought in the past. While a couple of Surprise Special Draw Sets in the past have not followed this rule, by and large, Cygames has declared that even if a Surprise Special Draw Set is purchased when limited holiday-themed characters are available, those limited characters will not be available to pick using a Surprise Special Draw Set. Since the start of 2018, Surprise Special Draw Sets have also excluded characters and summons released since the previous Surprise Special Draw Set. If you are interested in ticketing a relatively new character, you can check whether or not they are available via the redemption instructions above. For recommendations on what to choose for your Surprise Special Draw Set, refer to the SSR Character Tier List. The Fourth Anniversary Ticket allows you to choose characters from Draw Promotions. Thus, Holiday, Summer, and Halloween characters such as Mary (Holiday) or Heles (Summer) are available. However, Premium Gala (or Flash Gala) characters cannot be obtained by using an Anniversary Ticket. While officially there is no schedule for Surprise Special Draw Sets, past tickets can be used to estimate when the next one will appear. This page was last modified on 16 March 2019, at 13:20.